- We are amongst the well-regarded entity in the market for offering Custom Clearing And Forwarding Services. - We are an AEO Comapany as well. Being a frontrunner in the industry, we are involved in providing our customers highly qualitative Sea Import Custom Clearance Services. These provided services are offered in agreement with the defined guidelines to preserve our standing in the industry. To add, the employees rendering these services are appointed after stern analysis of their skills and experience. Our firm is engrossed in rendering Heavy Project Clearances Services. Knowledgeable experts who have affluent industry experience render this service. This service is extremely admired in the market due to reliability, timely completion and flexibility. We render this service at low prices to our patrons. We are a reliable company in this domain that is indulged in providing a range of Cargo Custom Clearance Service to our clients. 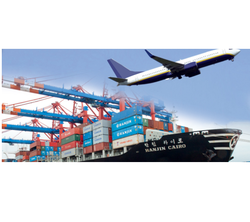 These Cargo Custom Clearance Services involve documentation, examination and registration of shipments. Additionally, these services are timely executed by us. We also provide Custom clearance services for clearance of export and import shipments, our in house sister concern is a Licensed Custom House Agency with an experience of more than 25 years in custom clearance and allied services. Our expertise in custom regulations and relations ensures that cargo is cleared on time without causing any delays. With thorough understanding of this business industry, we are engrossed in providing Custom Clearing Logistic Services to our clients. Due to personnel dedication and knowledge helps us to meet the detailed needs of the clients within the given period of time. We have adroit employees, who offer these services in agreement with the defined guidelines.